Review: Sweet Smell of Success, Arcola ✭✭✭✭ | Fourthwall Magazine & The Drama Student – The magazine for careers in the performing arts – actors, drama students, directors, producers, writers, production crew. Directed by Mehmet Ergen, Artistic Director of the Arcola, this cracking British premiere of Sweet Smell of Success is a production that feels like it’s about to blow the roof off the theatre. 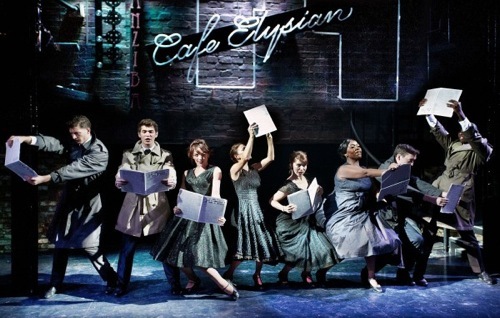 Marvin Hamlisch’s musical adaptation of the 1957 film depicts JJ Hunsecker, a New York journalist that commands the city – and indeed large swathes of the American public – with his mighty gossip column. David Bamber plays the king of gossip with incredible style. Bamber has an edge throughout the show that makes his performance quite special, even though his vaudeville number isn’t exploited to its full potential. He looks old enough to be the father of Susan, his half-sister, which only makes his over-protective relationship with her all the creepier. JJ takes desperate-for-a-break press agent Sydney under his wing, and gives him everything he could ever want. Sydney is played by Adrian der Gregorian, whose glorious voice and tremendous presence draws the audience in to the hotshot’s avaricious mentality. the ready-made star of this show is, without a doubt, Stuart Matthew Price as Dallas. Susan, meanwhile, falls in love with the sincere, genuine Dallas, whom JJ does not deem fit to be Susan’s lover. Caroline Keiff is an excellent Susan; with a delightful voice and stunning acting talents, she is a star in the making. However, the ready-made star of this show is, without a doubt, Stuart Matthew Price as Dallas. He has an effortless, breath-taking voice with a range that seems to never stop. He performs with such unwavering commitment that he is surely one of musical theatre’s brightest stars. Keiff holds her own, though, and matches Price’s vocal in their magnificent duets. A star turn comes from Celia Graham as Rita, Sydney’s girlfriend. The principals are supported by a strong ensemble that set the stage on fire with every appearance, particularly Russell Morton, Rebecca Louis and Brenan Davies. Ergen directs with a great sense of humour and uses the space with ingenuity; it is a marvellously slick, energetic production. The exposed steelwork and bare bricks of the Arcola, combined with Mark Bailey’s simple yet inventive monochrome design and David Howe’s dynamic lighting, conjures perfectly the smoky world of the jazz clubs and backstreets of fifties New York where all the glitz is undercut by brutal violence. Bob Broad’s direction of his savvy band is flawless and Nathan M. Wright’s snappy, imaginative choreography impresses throughout, making the most of the tight space. Sadly, although Marvin Hamlisch’s rich, jazz-infused score and Craig Carnelia’s lyrics are strong, the book from John Guare could do more. It is faintly topical, in the wake of the hacking scandal but does not do enough to blow the audience away. This is a stunning production of a less than perfect musical.